Quiz Night Saturday 17th January. 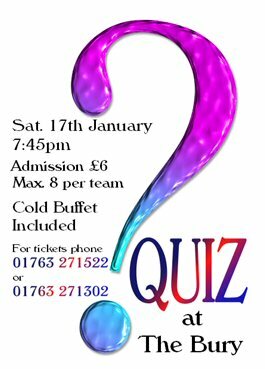 There will be a Quiz Night at The Bury on Saturday 17th January. Come along to the first BTFC fundraiser of 2009 when we will be holding a general knowledge quiz at The Bury. Teams may consist of up to 8 players. Tickets, priced at £6 per person, may be reserved by phoning 01763 271522 or 01763 271302. A cold buffet is included in the price.